Welcome to The Classics Circuit Harlem Renaissance Tour! For the Harlem Renaissance Tour, I chose a short story collection by Hughes. My review follows. This slim volume of fourteen stories explores the myriad of ways in which white people in America demonstrate prejudice against blacks. Published in 1933, most of the stories take place in that time period, and are set in either New York City or the rural South. In some the racism is overt and violent (think lynchings), but prejudice can be subtle as well. Take, for example, the maid whose family keeps her waiting on Christmas Eve and then is unable to pay her full wages, never thinking of the impact this has on the maid and her young son. Or the single woman living alone, who is so confused and conflicted by her feelings for the black janitor in her apartment building, that she is compelled to move. Cora Unashamed: a woman who has worked for a white family all her life. She is treated somewhat respectfully, until she begins to speak out about a family member’s pregnancy. Slave on a Block: profiles a white couple who “went in for Negroes … a race that was already too charming and naïve and lovely for words.” This story was the most squirm-inducing for me. Home: a young violinist returns to Missouri after several years in Europe, and encounters prejudice he had not experienced abroad. The ending is intense and difficult. This entry was posted in classics circuit, reviews and tagged racism, short stories. Bookmark the permalink. The book I’m reading for this circuit, Home to Harlem, by Claude McKay, was not very happy either, and I felt the way you did while reading. I don’t know if these writers had white readers in mind when they wrote these pieces, but perhaps discomfort was their aim? Thank you for sharing about this collection of short stories and for adding to the Harlem Renaissance Tour. I teach high school English, and one of my favorite things is teaching poetry from the Harlem Renaissance after we finish reading To Kill a Mockingbird. It is so nice to encounter an honest review of Hughes’ stories. I came across your blog on Paperback Reader’s blog, and I’m so glad I did! @Suzanne, I think you’re right about the discomfort being intentional. Reading the Hughes book, there were a couple of stories with a really high “squirm factor,” because if I was honest with myself, they hit closest to home. It’s the people who don’t squirm that I’d worry about! @Eva, I’m not much of a poetry reader either. I read a book of Hughes poetry a while ago just because of the local connection, and I was surprised that I liked it! @Jo, thanks for stopping by! What a great idea for your class to read HR poetry after TKAM. I’m sure that stimulates a lot of discussion. I really enjoyed reading Hughes’ poetry! This sounds like a hard book to read, albeit an important one. Thanks for joining the Circuit! Thanks Rebecca! I’m having a lot of fun participating in the circuit as well! With respect to Laura and Suzanne, in regards to the “squirm” factor, imagine how it must have felt for the people actually living through these experiences. Frankly, I think it’s a narcissistic attitude to believe that the intent was to upset whites. Granted the stories are upsetting but I am hard pressed to believe that was his aim. I believe he was merely a mirror of the times. Angelina, thanks for sharing your perspective. It’s been more than a year since I read this book but it continues to make me stop and think, as does your comment. I am doing my thesis on “The Ways of White Folks.” Hughes was not writing to offend anyone. He was writing about the interaction between blacks and whites in working class America during the 1930’s during the Great Depression. It is very political and if you read it closely you will find that he explicitly mentions major political events that mark the age of the Depression. If you teach this in class make sure you mention: The Bonus Marchers (Home), The Scottsboro Boys Case and Camp Hill Shootings (Father and Son), and The Great Depression (Passing). This collection belongs alongside literature that carries some of the same themes such as “The Grapes of Wrath” by Steinbeck and “Imitation of Life” by Fannie Hurst – who Hughes knew personally. It is a great read. Jason, thank you for your comments! This review is consistently the most-visited post on my blog, even 18 months later, but those visitors rarely leave a comment. I appreciate the insight you’ve brought from your research and your guide for teachers. Best of luck with your thesis! That these issues (even the patterns of behaviour described in the DQ) exist, still, should make us squirm. 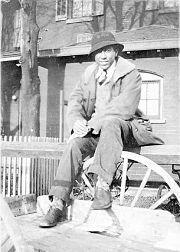 As a reader and writer, I am a fan of the Harlem Renaissance period (Zora and Langston are perhaps my favourites though I’ve also enjoyed works by Nella Larson, Claude McKay and others) because of how unflinchingly they pull back the curtain of the inner lives of black folks in that time. Art entertains, yes, but it also stirs things in us, provokes thought, gives insight to the human condition. I think that’s a good thing. It’s good as well that Langston’s writing captures so beautifully the rhythm and soul of the Blues. For me the beauty of his language makes him a joy to read no matter how difficult the subject matter. Joanne, I like your comment about the beauty of his language. This is especially evident in Hughes’ poetry, which I enjoy. Yes, love his poetry! That’s how I was introduced to him before discovering his novel Not Without Laughter and then the Simple stories and other short stories along the way. Btw, your blog makes for interesting reading…bookmarking. Hope you’ll check mine out as well http://wadadlipen.wordpress.com It’s really the blog of a writing programme I run but also includes in the Blogger on Books and Reading Room my musings on books as I read them and links to interesting reads I come across.